You can log in to the client only, or for more functionality, you can also log in to and run PureCloud side-by-side with the client. You can log in to the client and PureCloud in any order. Type your PureCloud login credentials. Type the name of the phone that you want to use. 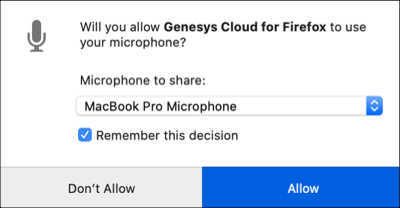 If you use Firefox, when you first select a WebRTC phone, Firefox prompts you with a window about sharing your microphone. Under Share Selected Device, select Always Share. If you do not select Always Share, Firefox continues to prompt you, and you cannot pick up incoming calls. After selecting Always Share, the prompt disappears and you can select a WebRTC phone and settings. For next steps about selecting a WebRTC phone, see WebRTC phones for all browsers. Note: Internet Explorer, Microsoft Edge, and Safari do not support WebRTC phones. For Firefox users, before selecting a WebRTC phone for the first time, see WebRTC phones for Firefox users (first time). Change the behavior of the WebRTC Phone window. Note: If you are unable to log in, then check with your administrator about the URL used for PureCloud_Environment during installation.